Here’s a quick update on the Blinq smart ring, which we previously previewed back in 2017. The Kickstarter campaign was fully funded in 48 hours, highlighting just how popular this category is. The are currently in the process of shipping rings to all those who ordered during the campaign. It doesn’t look like they are accepting any more order at the moment, but if you want to get on board the Blinq train, head to their website, Facebook page or Kickstarter page. 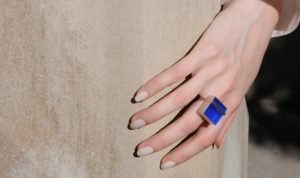 The makers of the Blinq Smart Ring use the catch cry “Fashion Meets Technology. Filter the Noise”. The Blinq Smart Ring has similar functionality to the (now unavailable) Ringly Smart Ring. Based on the design of the Blinq, it falls fair and square in the Smart Jewelry category. That means this ring competes with the likes of Modulaj (by TrIIng) and other rings such as Siren Ring (not yet on the market) and Loop Ring. As with other smart jewelry, the Blinq Smart Ring will take up quite a bit of your finger real estate but as we have said before, that is par for the course at the moment for Smart Ring jewelry. Early feedback has been mixed, check out comments on the Kickstarter comments to see what people think – but our analysis is that (as is common with a lot of Kickstarter campaigns) shipping is the biggest issue. However, this is often overcome as logistics issues are overcome. Blinq states that their jewelry uses “natural hand-cut gemstones” so slight variations in color will occur. It is water resistant but not waterproof so it’s great for everyday use but it would be best to take it off when you swim, shower or bathe. The Blinq Smart Ring will come in a range of sizes from 5-12. What can the Blinq Smart Ring do? The Blinq Smart Ring has the ability to track fitness, receive notifications and trigger SOS or panic alert functionality like those that Siren Ring, Nimb and Loop Smart Rings offer (head to our Best Safety Smart Rings blog post for more information). With the Blinq Smart Ring you will be able to interface with your Android or iOS smartphone. Doing so will allow you to set custom alerts for things like phone calls, texts and emails plus alerts for specific contacts you choose from the supporting Blinq app. The Blinq Smart Ring will also allow you to set up App alerts (eg notifying you if your photo just got liked on Insta) and like other smart rings, Blinq can work with 100s’ of your favourite apps. In line with other Smart Rings on the market, the Blinq Smart Ring is looking to solve the problem of blocking “digital noise” in your world whilst keeping you connected to the important things that matter to you most. This entry was posted in Ring Reviews and tagged Blinq, Blinq Smart Ring, receive notifications, Smart Jewelry, smart ring, SOS and panic alert. Bookmark the permalink. ← Just How Big Is The Smart Ring Market Size?